For several years, the Georgia Secretary of State conducted the Peanut Poll, a straw poll held every year at the Georgia National Fair in Perry. Each year, the straw poll focused on participant’s choices for federal elected office such as President and U.S. Senate. One of the most successful straw polls in the country, the poll was a part of the Georgia Secretary of State’s mission to raise awareness about elections and encourage voter registration. However, in 2017 with no major election pending, the Secretary of State’s office sought to re-brand the Peanut Poll to be a contest to have Georgians pick the best high school football team in the state. In addition to a re-branding to reflect the change in direction of the poll, the Secretary of State sought to develop a new website and online polling system that would allow Georgians to vote for one of the 460 high school football teams online and on tablets at the Georgia Grown booth at the fair. After voting, participants would be directed to the Secretary of State’s online voter registration page to check their registration status and register to vote if they had not already. The new “Gridiron Showdown” Peanut Poll sought to engage high school students who were now eligible to register to vote, but had not yet done so. 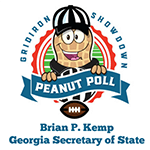 With the Georgia National Fair coming up quickly, the Arc 3 Communications team worked expeditiously with the Secretary of State’s Outreach Staff to create a new and unique brand for the Gridiron Showdown Peanut Poll. A new mobile first website was developed that incorporated a polling system that allowed for visitors to quickly vote for one of Georgia’s 460 high school football teams. Upon voting, Georgians were directed to the Secretary of State’s online voter registration page. At the Georgia National Fair’s Georgia Grown Booth visitors were presented with i-pads upon which they could visit the website and vote for their favorite team while voters from across the state also submitted their ballots on the website. The website polling system calculated and displayed the results in real-time as they happened. Each day at 5 p.m, a special guest would announce the results at the Georgia Grown Booth at the Fair. Voting results announced on the website were easily able to be shared on social networks. The new Peanut Poll brand incorporating a football referee raised awareness about the new nature of the poll and athletic directors from across the Georgia High School Association were excited about the poll and encouraged students, athletes and parents to participate. The Georgia National Fair also publicized the straw poll and the opportunity to vote at the Georgia Grown booth. By the time of kickoff and voting began, media outlets around the state had already started talking about the Gridiron Showdown Peanut Poll and social media was buzzing. After ten days, over hundreds of thousands of votes had been cast making the Peanut Poll one of the most successful straw polls and voter registration efforts in the country. The Peanut Poll was embraced not only by high school communities in and around the Georgia National Fair in middle Georgia, but by 460 school communities from across the entire state. Participants from all walks of life participated in the Peanut Poll, including some celebrity voters such as U.S. Secretary of Agriculture Sonny Perdue who visited the Georgia Grown Booth and cast his vote for his favorite team. Special guests who announced the daily results included Georgia Agriculture Commissioner Gary Black who also cast the first vote at the fair online. In the end, the new Peanut Poll was a success in its ultimate goal of encouraging folks to register to vote. The Georgia Secretary of State’s online voter registration page saw not only a surge in visitors, but also an increase in voter registrations. Because of the 2017 Gridiron Showdown Peanut Poll, new voters will cast their ballots in the 2018 Elections for the first time. These new voters will cast their ballots for something more important than their favorite football team; they will have the opportunity to vote for who will serve them in public office at the local, state and federal levels.